“Healthified: Holiday Beverages” is a three-part series of Total Wellness Magazine. “Classic Holiday Beverages” is the first article of the series. There's no escaping the holiday spirit. Grocery stores are stocked with holiday-inspired items, while homes and public spaces are adorned with garlands, wreaths, and Christmas trees. Of course, we cannot forget about the abundance of delicious holiday beverages that coffee shops offer during this time of the year. There’s the classic peppermint mocha, topped with whipped cream and chocolate shavings to satisfy your sweet tooth. Or, if coffee isn’t for you, you can be sure to enjoy a gingerbread tea or hot chocolate at almost every cafe. Although these beverages taste ridiculously amazing and are an essential component of the holiday season, the ones typically found at popular coffee chains are often loaded with artificial flavors, high-sugar syrups, and preservatives. In fact, many of the holiday drinks do not even contain the real ingredients, but are instead flavored with simple syrups. As many may know, high consumption of refined sugars can contribute to increased health risks, ranging from acne, weight gain, and lower mood, to potentially life-threatening illnesses such as diabetes and heart disease. 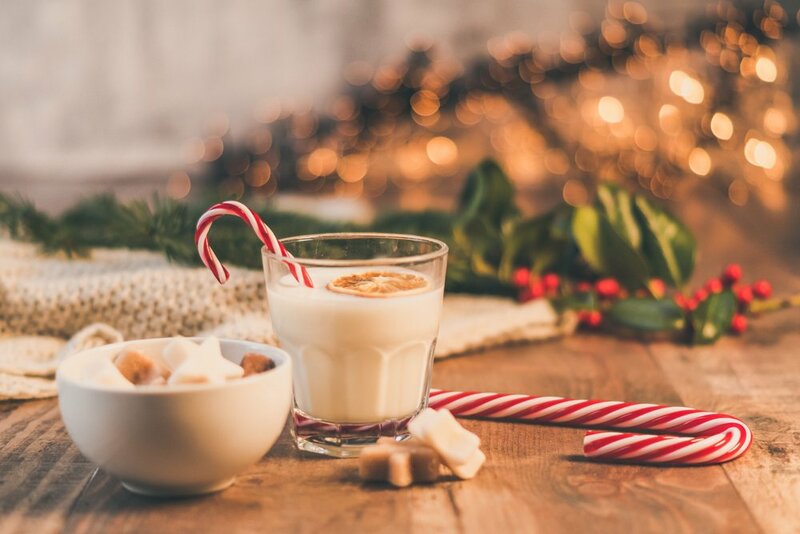 [1, 2] However, while it is true that holiday beverages contain large quantities of processed sugar, this does not mean that you cannot ever enjoy these drinks again. By recreating them at home, you can not only feel at ease knowing exactly what you are putting into your body, but also customize the flavor and sweetness of your drink. Not to mention, you are less likely to break the bank! 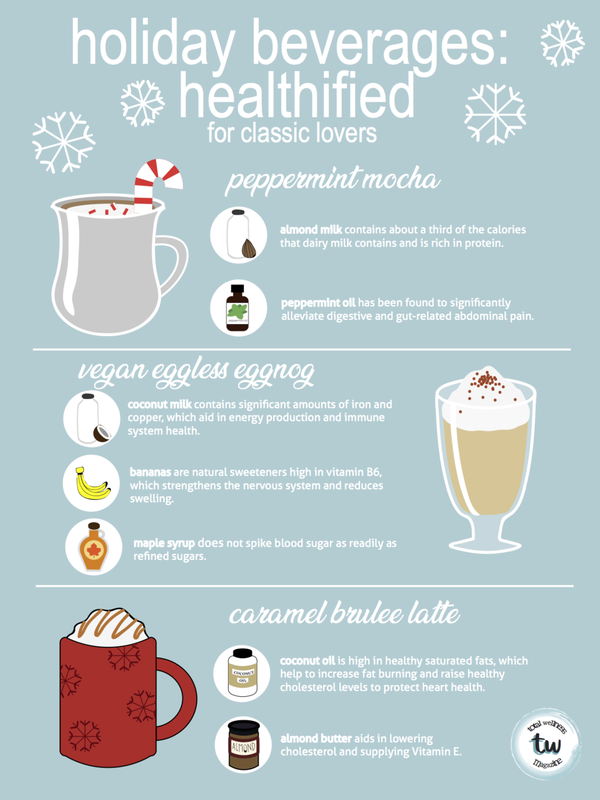 Here are some simple and healthy alternatives to classic holiday beverages that you can make at home this holiday season. Drink away! Place the milk, banana, spices and agave nectar or maple syrup in a blender and blend for 30 seconds or until smooth. Pour into mug and top with ground cinnamon if desired. Line your mug with the caramel sauce. Add brewed coffee to the mug. Heat your milk of choice and pour into the mug. Melt the coconut oil and maple syrup together in a microwavable bowl for 1 minute. Add the almond butter and mix until fully combined and smooth. A popular favorite of many, the peppermint mocha is an espresso drink that blends milk with peppermint and chocolate flavors. Peppermint oil is derived from the peppermint herb and has been found to significantly alleviate digestive and gut-related abdominal pain. Instead of flavoring the beverage with high-sugar syrups like most chain coffee shops do, you can use cocoa powder, which is derived from cacao beans and delivers a more authentic chocolate flavor. Add coffee and 1/8 cup milk in a small saucepan over low heat. Add in honey/agave nectar/maple syrup, cocoa powder, and chocolate. Continue heating while stirring over low heat for 4 minutes or until chocolate melts. Stir in peppermint oil and pour into mug. Optional Froth: Place remaining 1/8 cup milk in a microwave-safe container with a lid. Shake for 1 minute until milk is frothy. Remove lid and microwave milk for 30-60 seconds. Top your mug with the milk froth and enjoy! The night before, pour coffee into an ice cube tray and place in the freezer. On the day of, place banana into the blender and blend until the banana becomes crumbly. Add almond milk and blend until smooth and creamy. Add coffee ice cubes and blend until well mixed and smooth. Add cocoa powder and peppermint extract. Blend until smooth. Pour into a cup and top with whipped cream and enjoy! Significance of diet in treated and untreated acne vulgaris.” Adv Dermatol Allergol. (2016). “Added Sugar Intake and Cardiovascular Diseases Mortality Among US Adults” JAMA Intern Med. (2014). “High fructose corn syrup and diabetes prevalence: A global perspective.” Global Public Health. (2012). “What Are the Advantages of Coconut Milk Vs. Dairy Milk?” livestrong.com. (2017). “Top 10 Evidence-Based Health Benefits of Coconut Oil.” healthline.com. (2018). “The health benefits of almonds.” medicalnewstoday.com. (2017). “Efficacy of Peppermint oil in diarrhea predominant IBS - a double blind randomized placebo - controlled study.” Mymensingh Med J. (2013). “The Role of Carrageenan and Carboxymethylcellulose in the Development of Intestinal Inflammation.” Front Pediatr. (2017).